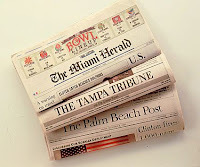 Miami is served by numerous newspapers, the major English-language newspaper is The Miami Herald; El Nuevo Herald is the major Spanish-language newspaper. Other major newspapers include Miami Today, headquartered in Brickell, Miami New Times, headquartered in Midtown, Miami Sun Post, South Florida Sun-Sentinel, Miami Times, and Biscayne Boulevard Times. Two additional Spanish-language newspapers, El Sentinel and Diario Las Americas also serve Miami. The Miami Herald is Miami’s primary newspaper with over a million readers and is headquartered in Downtown in Herald Plaza. Several other student newspapers from the local universities, such as Florida International University's The Beacon, the University of Miami's The Miami Hurricane, Miami-Dade College's The Metropolis, Barry University's The Buccaneer, amongst others.